The food allergen testing market, in terms of value, is projected to reach USD 760.7 million by 2022, at a CAGR of 6.8% from 2016. The market growth is driven by various factors such as stringent labeling mandates and demand for advisory labeling, growth in incidences of allergic disorders among consumers, globalization of food trade, and increase in food recall for undeclared allergen products. In the market engineering process, both “top-down” and “bottom-up” approaches were extensively used, along with several data triangulation methods, to carry out estimations and projections for the overall market and its subsegments, as listed in this report. Extensive qualitative and quantitative analysis was conducted on the complete process in order to list key information/insights throughout the report. Secondary research was carried out to determine the number of undeclared allergen recall cases and incidences in regions such as North America, Europe, Asia-Pacific, and RoW; trends for food testing industry, and their contribution. The market research is carried out through secondary sources such as Codex Alimentarius Commission (CODEX), Centers for Disease Control and Prevention (CDC), The European Federation of National Associations of Measurement, Testing, and Analytical Laboratories (EUROLAB), and Food and Agriculture Organization (FAO), while their market share in respective regions have been determined through both, primary and secondary research. The research methodology includes the study of annual and financial reports of top market players, as well as interviews with industry experts (such as CEOs, VPs, directors, and marketing executives) for key insights (both, quantitative and qualitative) for the food allergen testing market. "To know about assumptions considered for this research report, download the pdf brochure." This research report categorizes the food allergen testing market based on source, food tested, technology, and region. The food allergen testing market size is projected to reach USD 760.7 million by 2022, at a CAGR of 6.8% from 2016. Allergic patients completely rely on the labeling of ingredients before purchasing the product, to gain information that will help them avoid any allergens. The Food Allergen Labelling and Consumer Protect Act (FALCPA) has mandated the declaration of eight major allergens on the food labels. Such labeling mandates are fueling the growth of the food allergen testing market. Undeclared allergens in packaged foods cause serious health hazards for allergic consumers. The data on food recalls collected by various food safety organizations for undeclared allergens encourage the need for allergen testing in the food products before and after they are packed. The food allergen testing market, based on type, has been segmented into peanut & soy, wheat, milk, egg, tree nuts, seafood, and others (which include sulfites and other cereals). The peanut & soy segment is estimated to dominate the mycotoxin market in 2016. Peanut allergy is common among all age groups. After peanut, soy is considered a major source of allergen, especially among children and infants. 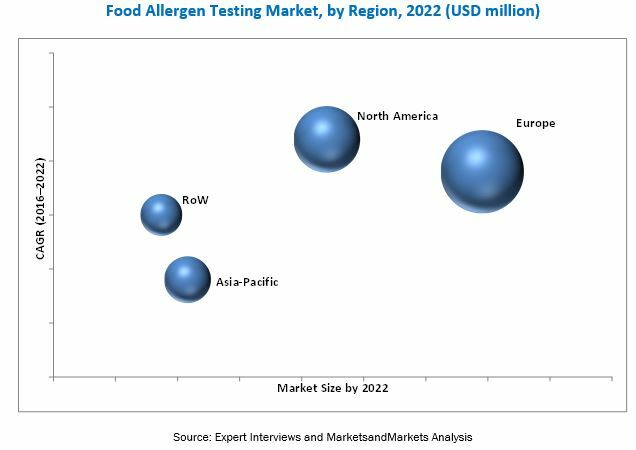 The food allergen testing market, on the basis of technology, is segmented into polymerase chain reaction (PCR)-based, immunoassay-based/ELISA (enzyme-linked immunosorbent assay) and others include LC-MC/MS, test kits, and other chromatographic technologies. The immunoassay-based/ELISA-based technology is projected to grow at the highest CAGR among all technologies from 2016 to 2022. The ELISA technique is based on the protein's characteristic of binding to specific enzyme-labeled antibodies. The simplicity of this method aids in its implementation and is beneficial for allergen testing in manufacturing plants at different stages of the value chain. The food allergen testing market, based on food tested, is categorized into bakery & confectionery, infant food, processed food, dairy products & its alternatives, seafood & meat products, and others (which include savory items, sauce, and other additives). The processed food segment is projected to be the largest and the fastest-growing market in the food allergen testing market. These foods contain multiple allergens, out of which some are directly added (inheritably present in the raw material) while some are a result of cross-contamination. Snacks with spices are the most complicated to test for allergens, as they comprise multiple ingredients. This factor is fueling the market growth for allergen testing in processed food. The food allergen testing market is estimated to be dominated by the European region in 2016. European countries have recorded many issues related to food allergens; as a result, stringent policies that have been established to achieve complete food safety. Though concerns regarding food allergens have been increasing, consumers are uninformed about such outbreaks. Public awareness has been gradually increasing in countries such as Germany, the U.K., France, and Italy. Peanut accounted for a majority of the allergies in the European region. Manufacturers in a few regions lack the necessary awareness regarding food safety regulations; due to this, they do not perform in-house testing or outsource it to laboratories. This restrains the development of the allergen testing market. New service/product launches, expansions & investments, acquisitions, agreements, collaborations, partnerships, and new technology launches are the key strategies adopted by the players to ensure their growth in the market. Companies such as SGS (Switzerland), Intertek (UK), TÜV SÜD (Germany), Eurofins E (Luxembourg), and ALS Limited (Australia) have acquired leading market positions through their broad service portfolios that are specific to various allergen segments. The companies are also focused on innovations and geographical diversification. In December 2015, SGS entered into a partnership with Biopremier (Portugal), a specialist in molecular biology and DNA sequencing. This partnership delivered new-generation sequencing (NGS) to the food supply chain, which helped in verifying food authenticity by reducing food frauds. 12.4 TUV SUD PSB Pte. Ltd.
*Details on Business Overview, Products Offered, Services, Key Insights, Recent Developments, SWOT Analysis, MnM View Might Not Be Captured in Case of Unlisted Companies.